Honeywell 2162361 micro switches. N.O. Micro switch. 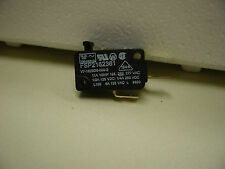 Microswitch limit switch trip switch actuator FSP2162361 Nitrus NOS fuel injector. 1A 1/3HP 125,250,277 VAC. Ten pieces. 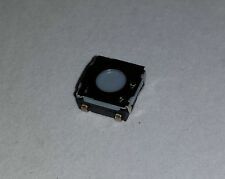 Mounting Style - SMD/SMT. This Cherry switch has been manufactured to give rugged performance. Cherry DB2C-C1A Micro Switch. During that process you will be issued with an RMA number. Miniature V4NT7-UL Microswitch. Burgess England. 5A 125-250VAC. Push button action. Changeover operation. Patterson Miniature V3P Microswitch. Red Push Button to operate. Their function is “changed over�� when switch operated. Type MP113. (now discontinued). Microprecision S.A. of Switzerland. Single pole changeover. Superb Swiss quality. 4x5 Micro Switch Matrix Keypad Module 8 LED Pi Uno Arduino. 16 Button micro switch keypad. 4 Button micro switch keypad. This module is ideally suited to adding a keypad to your project. This is the 4x4 matrix keypad (K1 – 16) and 4 separate switches (S1 – 4) which provides 4 columns and 5 rows of switches. LC Technology. Pin pitch Main Colour This module is ideally suited to adding a button to your project. The small nature of the entire module makes this keypad ideal for use just about anywhere on your project and ideal for debugging a project. 10 Pcs AC 125V 1A SPDT 1NO 1NC Momentary Long Hinge Lever Micro Switch. Long hinge lever, 1NC 1NO contact, 3 pins, SPDT, momentary type. Micro Switch is widely used in the fields of electronic product, computer mouse, instrument and meter, household appliance and more. Lever Size (Approx.) : 13 x 4mm/0.5" x 0.2"(L*W);Pin Width : 0.7mm/0.03" Size (Approx.) : 12 x 6 x 13mm/0.5" x 0.2" x 0.5"(L*W*T ); Brand Unbranded MPN Does not apply UPC 4894462062951 EAN 4894462062951 ISBN 4894462062951 Designer/Brand Unbranded UPC 4894462062951 EAN 4894462062951 ISBN 4894462062951. 4x4 Matrix keypad. This module is ideally suited to adding a keypad to your project. This is the 4x4 matrix keypad which provides 4 columns and 4 rows of switches. Pin pitch Main Colour Form Factor. 10 X (50 pieces) Tactile Switch 6m X 6m PCB. 6m actuator. SPCO (Single Pole Change Over). 16 Amp 380VAC. These are a heavy duty, quality switch as one would expect from the SAIA stable. if one imagines a pendulum swinging over the switch the forward swing would operate it the backward would not, I have tried to demonstrate this in the photographs. Marquardt 1022 Series snap action single pole micro switches. Cherry DB3C-B1LC Microswitch SPDT 0.1A 250V AC, Medium Lever, Q.C. This Cherry switch has been manufactured to give rugged performance. Cherry DB3C-B1LC Micro Switch. During that process you will be issued with an RMA number. RoHS compliant. High current microswitch with roller lever actuator. Manufactured by Panasonic - Part # AM1703KF. 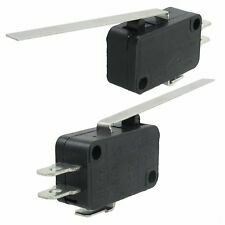 10 A High current switching capacity and high precision. Our Ref: #1403. 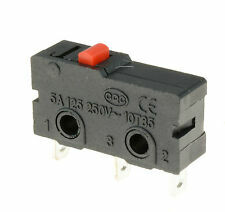 This DG13-B1RA sub-subminiature microswitch from Cherry is suitable for many industry applications. Save on this HONEYWELL 16 Amp Micro Switch LOT of 10 SPDT (Single Pole Double Throw) V5P110PB3C MICRO SWITCHES. Release Force 20 g Min. Original unused Honeywell Micro Switch, item is OEM not a cheap knock off. Microswitch Type : Subminiature. MICROSWITCH SEALED SIM ROLLER SPDT. Microswitch Actuator : Simulated Roller Lever. Country Of Origin : JP. Type Z heavy duty microswitch with panelled push button actuator. Connections via screw and cup washer. Phenolic resin push buttons. Images shown are for demonstration purposes. Size 49.2 x 17.45 x 24.2mm. 5 x 3-Terminal SPDT 1NO 1NC Momentary Micro Switch 3A/250VAC 5A/125ACFeatures: Single Pole Double Throw (SPDT) Type, 1NO 1NC Contact, Momentary Action, Push Button Actuator, 3-Pin Terminals, etc. Durable material construction, long using life. Easy installation. Widely used in electronic equipments, automatic machines, etc. Overall Size : 2 x 1.5 x 0.5cm / 0.8 x 0.6x0.2(L*W*H Mounting Hole Dia. : 2.7mm/ 0.1 Mounting Hole Spacing : 7.3mm / 0.29 Push Button Size : 3 x 2mm / 0. Product Range : D2HW Series. MICROSWITCH SEALED PLUNGER SPDT. Microswitch Actuator : Pin Plunger. Microswitch Type : Subminiature. You are purchasing part number D2HW-BR201H Manufactured by OMRON ELECTRONIC COMPONENTS.